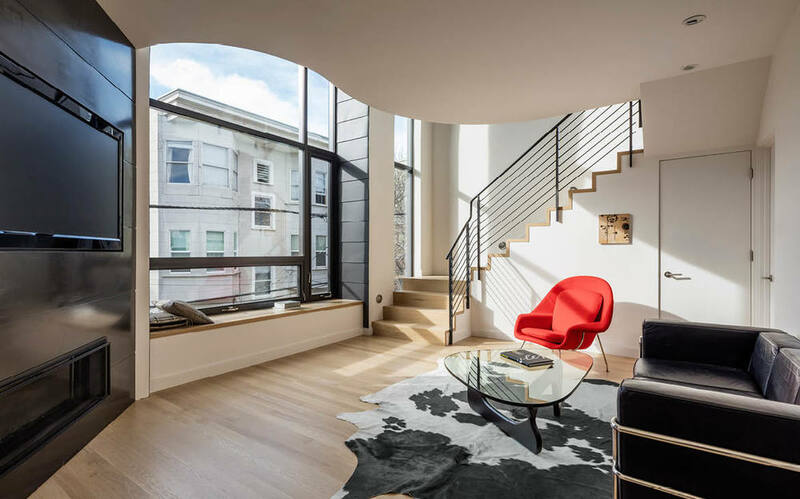 The Linden Street Duplex in San Francisco’s changing Hayes Valley neighborhood is a ground-up building project fully completed through in-house labor by Webb Construction in 2015. The lot, the former home of a dilapidated garage posed its own unique constraints: a small, shallow lot; the absence of space for cranes and other heavy machinery, and the neighborhood's unique architectural rhythm that the building’s designers wanted to both measure and modernize. Interpreting the local codes of bay window, awning, cornice, and balcony—custom exterior zinc surfaces designed to “confound spatial and perceptual boundaries” were installed. These metal surface wrap both around and through large panels of glazing on the interior and exterior. The zinc panels will mark the passage of time as they weather from black to gray: a play ofthe neighborhood's light and movement that reveals itself on the Lindon Street building. The building’s curved Mansard roof was developed to mitigate the building’s height to the neighboring properties, while creating dynamic interior spaces that called for custom-fit finishes throughout.